The SAP Open has never attracted an incredibly deep field of international competitors, but it has always attracted the top American talent. In past generations this included John McEnroe, Andre Agassi, Michael Chang, Andy Roddick, and James Blake. These days, the tournament still attracts the top American talent. It’s just that these days, that talent looks a little different. 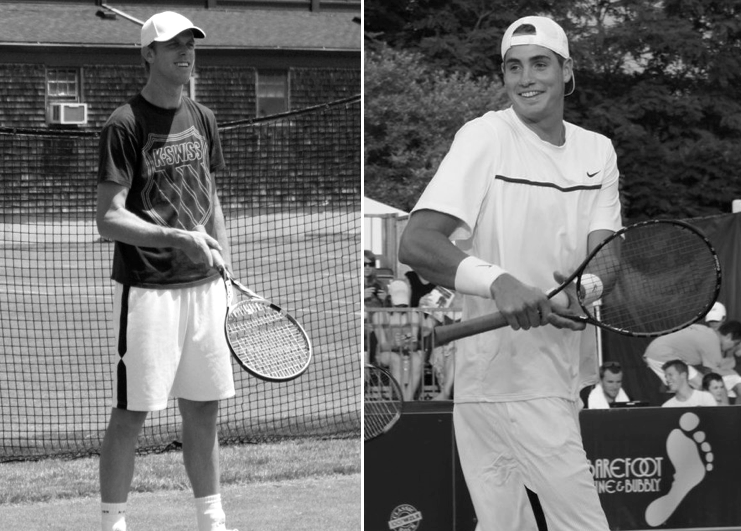 Meet John Isner and Sam Querrey. Formerly background players and supporting guest-stars on the stage of American tennis, they are now the leading men. Ranked No. 16 and No. 20 respectively, the best friends teamed together to (barely) lead the USA Davis Cup team to a victory over Brazil in the first round of Davis Cup competition a couple of weeks ago. They’ve been around for about six years, but now with the ATP tour back in the United States for the first time since Roddick’s retirement, the spotlight on them will be brighter than ever. When most people picture the stereotypical American athlete, they picture a meat-head jock. An aggressive, egotistical, and dim-witted competitor with bravado to spare. Even though the tennis version of the jock is usually slightly nerdier, there’s still that swagger and alpha male energy that makes them stand out from the crowd. But then there’s John Isner and Sam Querrey. Or, as they’re so often known, Quisner. John Isner is the laid back southerner from North Carolina who loves being part of a team, loves watching wrestling, and loves to stay at home. He talks with a slight lisp and often keeps his head down in press conferences, but always give insightful and in-depth answers to questions despite his lack of eye contact. Unlike a lot of the Americans who tend to stick to their Davis Cup teammates for companionship, he seems to be friendly with everyone on tour, from Pico to Mahut to Fognini. Together, Sam and John are more likely to be seen slumping their shoulders than throwing a tantrum, and are more likely to be found reading the gossip magazines than in them. They’re both very sensitive, with Sam famously admitting burn-out in 2010, and Isner always talking frankly with the media about his confidence issues, but they’re also remarkably resilient. And while they might not have the Grand Slams, celebrity, or ego of their American predecessors, it’s time to appreciate them for what they are. Because, frankly, as far as American men’s tennis right now, they’re it. In 1980, there were seven Americans in the top 10. Right now there are seven (officially) in the top 100. Roddick’s retired. Mardy Fish has been derailed by a scary heart condition, and hasn’t played since the US Open. Michael Russell is 34. Brian Baker showed a lot of promise last year when he was healthy, but he has yet to prove that he can stay uninjured and consistent enough to really be a threat. Ryan Harrison is a great talent, but he’s only 20 and his best tennis is likely a few years down the line. Thus we’re left with Quisner. It’s alarming that a country with such a rich tennis history is struggling so much. The United States certainly has the athletes, the resources, and the juniors infrastructure to develop more top players. In fact, with the Orange Bowl and the Kalamazoo Championships, it has two of the most prestigious junior tennis events in the world. There certainly wasn’t a time when kids in American weren’t playing tennis. So what happened to these top prospects born between 1984-1990? Not only are only three of them in the top 100 currently, but by my count only five others have ever been in the top 100 (Sweeting, Young, Odesnik, Levine*, and Ram). Swayed by easy money, pushy agents and the example set by previous generations, they chose the trial-by-fire rigors of the pro tour instead of the seasoning of college. The decision took a toll on young bodies and still-developing psyches. For top U.S. tennis officials, they represent a lost generation. A decade ago, everything was different. With Courier, Martin, Chang, and Sampras retired and Agassi on his way out, sponsors and the USTA were eager to find the next wave of marketable American stars. Seeing what great success Andy Roddick had at such a young age after turning pro, everyone was eager to duplicate that model. It looked easy, like a no-brainer. Roddick, Safin, Hewitt, Nadal, and Federer were all winning Slams in their early twenties. Brendan Evans, 26, signed with IMG and was offered a six-figure contract with Nike when he was only fifteen. He retired from the tour last year after struggling with injuries. His career-high ranking was No. 117 and he only had six ATP wins in his career. Twenty-six-year-old Scoville Jenkins, who won the Kalamazoo 18s in 2004 and turned pro, is no longer on tour either. He had a career high ranking of No. 187. Alex Kuznetsov, 25, turned pro when he was 18 after being offered a $2 million dollar deal with Nike. He is still on tour, but is currently ranked No. 267 and has a career-high ranking of No. 157. And they’re the success stories. Phillip Simmonds, 26, is still on tour and ranked No. 557. His career-high ranking is No. 219. Scott Oudesma, also 26, chose after agonizing over his decision to turn pro at 18, due to the sponsorship offers. He reached a career-high ranking of 255, and is long gone from the tour. “These kids are practically threatened. The USTA is doing everything possible to get them to turn pro, and they aren’t going to give them wild cards into events if they say they’re going to college,” Smith said. “The USTA is running a business, and their goal is to fill Arthur Ashe Stadium at the U.S. Open. I truly believe if they burn 10 or 20 kids along the way to get that done, they will do it. Last summer I talked with Michael McClune, who at twenty-three is a couple of years younger than the others. He won the Kalamazoo Championships in 2007, and turned pro right afterwards. When we chatted at the Winston-Salem Open, five years after his pro debut, he had just won his first ATP match. McClune lost his second round match in Winston-Salem to Jurgen Melzer, but he had four match points on the former top-tenner. I was impressed with his game and optimistic for his future. However, his ranking has fallen back to No. 364 and last week he lost in the first round of the Dallas Challenger qualies to Jean Anderson, ranked No 988. So how did two laid back jokesters emerge from this tennis rubble to become top 20 players with wins over the”Big Four”? Well, they certainly didn’t take the same path. As mentioned above, Querrey turned pro right out of high school in the summer of 2006. He won two out of the first three Challengers he entered, and found himself in the top 100 by February of 2007. Despite a brief exit due to an injury layoff, he’s remained in the top 100 his entire career. Isner, meanwhile, was far off of the sponsorship radar when he was 18. He got a scholarship to Georgia to play tennis, and became the top college player in the country. It was nearly unheard of for a player to have success on the ATP Tour after spending all four years in college, but that didn’t stop him. He turned pro a year after Sam in the summer of 2007, and immediately won a Futures event, a Challenger, and then made it to the final of Legg Mason. He first entered the top 100 in February of 2008, and has been there since June of 2009. Last spring he briefly broke into the top 10. Though their routes were different, it’s worth noting the similarities. Neither John nor Sam spent time in a tennis academy in high school – they both lived at home and kept their lives completely normal until they were 18. They both seem to have supportive–but not overly-involved–parents. Their dual “aw shucks” attitudes–so non-stereotypical for American players–have kept them humble enough to put in the hard work, and level-headed enough to survive the bad days. And then there’s the serve. There’s no doubt that tennis is more physical than ever, with fitness and footwork now outweighing serving and shotmaking in the top 50. This shift happened during the time that Querrey and Isner were starting out, and their serves bought them time to catch up with (or at least close in on) the rest of the tour in those regards. Players without such a strong weapon often find themselves trapped on the Challenger or Futures tours, so close but so far from their childhood dreams. Once trapped in the lower-level grind of cheap hotel rooms and week-to-week earnings, it’s hard to escape. At a certain point, the drive and confidence that led you to turn pro at 18 falls away along with the sponsorship deals and the spotlight. Querrey and Isner both skipped quickly over that stage. It’s important to note that these days more and more junior standouts are the choosing college route, probably due to Isner’s example and the failings of the previous generation. With ATP players peaking later and later in their careers, and the top four making it so much more difficult to break through, it’s natural that there would be a shift. 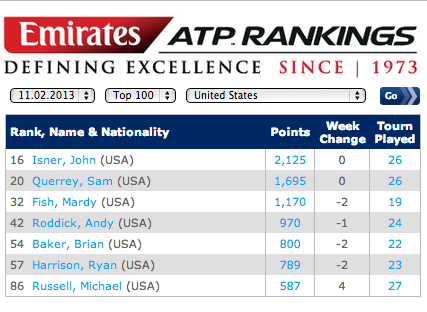 But only time will tell whether this produces more players in the top 100, or whether John Isner is another outlier. Compared to the rest of this generation, it’s hard not to marvel at Isner’s and Querrey’s careers to this point. But as the No. 1 and No. 2 of American tennis, they’re now put into another class, one that has a lot less moral victories. Though they ended up winning, their Davis Cup tie against Brazil was scarily close. They both have shown that they are capable of bringing their best tennis on the big stages — Querrey has beaten Andy Murray in a final, and Djokovic at the Paris Masters, and Isner has defeated Federer in Davis Cup, and Djokovic at Indian Wells — but their consistency continues to be an issue. Despite their career win totals and titles, which are obviously far below their predecessors, it’s absolutely alarming how bad their five-set records are. This is a key reason why they haven’t had more success in Grand Slams. Isner in particular has been in a five-set free-fall ever since playing his famous marathon match against Mahut. He’s played seven five-setters in the last 13 months and lost six of them. Five of the six losses were to players ranked below him, including his exits in all four Majors last year. It’s a disturbing trend that showed up again in Davis Cup last month when he lost to Thomaz Bellucci in five sets after having a chance to clinch the tie. Time and time again he gets dragged into playing extended matches with players ranked below him. The margins in his game are so small that unless he’s 100% mentally “there” during a match, he has as much of a chance of losing to a player outside of the top 100 as he does of beating a player in the top five. He has built a top 20 career on small margins, but there’s also a distinct possibility that he will plateau and crumble on them as well. While Querrey’s more aggressive game doesn’t get him dragged into extended matches as often as Isner, his 1-5 record in five-setters is hardly any better. It’s also alarming that he’s below 50% in his career in tiebreaks and deciding sets, which is seemingly unheard of for a player with his powerful serve. Even Michael Chang was a better tiebreak player! Though they’ve already surpassed their peers and the expectations of so many, it’s hard not to look at those statistics and feel like Querrey and Isner have left a lot of career on the table, and that they have the potential to climb even higher in the next few years. It’s nice for them–and for American tennis–that they have each other for motivation and support, since the rest of their peers are so far behind. We don’t get any do-overs in life. We’ll never know for sure if we could have multiplied the amount of Americans in the top 100 right now by keeping them in college or training them differently. There’s always the possibility that the talent was never there in the first place. The ATP is more competitive and global than ever, and the days of the top 100 looking like an American frat house are far gone. But with the resources the country has, it would be foolish not to look back and examine the stories of those who have struggled. It’s going to be interesting to see how the next two months of tennis in the United States look with Isner and Querrey at the helm. I hope that they both step up proudly into their roles, win some smaller tournaments, and make deep runs at the Masters. They’re certainly both capable of that. But even more than that, I hope that the American public will look beyond their often-dopey demeanors and waiting-in-line on-court personas and appreciate them for the fantastic athletes and great human beings that they are. Unfortunately it’s too late to save a great tournament like San Jose, and it’s likely that due to the depth of the game we must make-over our entire expectations of American tennis going forward. Perhaps the Quisner years will be viewed a mere lull between the Roddick/Blake and Harrison/Sock years. Or perhaps we’ll look back on this time a decade from now and think how lucky we were to have two guys in the top 20. Only time will tell. But right now we have Quisner. Gosh darn-it, you guys. Let’s enjoy it. Gotta love @Quisner! Always fun hanging out with them. 2 of the happiest and funniest dudes on tour. From what I’ve seen, the vast majority of tennis articles on Quisner are implorations for them to stop being so disappointing and do a better job of representing American tennis. They have some valid points — Isner needs to improve his dismal 5-setter record, for one — but it does seem to be overlooked that while Isner and Querrey are not going to be Slam contenders any time soon, they’re still nice, upstanding guys who genuinely enjoy their sport and aren’t exactly failures with them being consistent top-20 fixtures. Of course, right after I post that comment, Isner goes and tweets *that*. Sigh. Still, the latter half of my point stands. Ophella, it’s so complicated, which is why this piece was so broad. On the one hand, if we didn’t have them things would be very dire. Compared to their more highly touted peers, they certainly have been successful, so it’s important to keep perspective. But at the same time, it’s frustrating to see them get so close to being better and not make it. Expectations have to continue to raise based on results, it’s only natural. I guess it’s just important to keep both things in mind. They are nice guys though- if you can overlook the political beliefs- which, considering Isner’s from my hometown and most of my family agrees with him, I try to do. Anyways, thanks for reading! no disrespect intended, but have you ever playing competitive tennis? do you have any idea how hard it is? people dream about being in the top 100 and these guys are consistently in the top 20! you guys should be happy you have 2 excellent guys representing your country after an era of legends, because its hard to outdo the the achievements of Sampras and Agassi! These guys have a loads of expectations on their shoulders but they are still young and can do amazing! Wait, what did Isner tweet? Lindsay, this is a terrific writeup of American men’s tennis right now. You wrote a piece a while back where you promised to make indifferent readers care about Sam Querrey, and you did, for me (to my shock). And now you’ve pointed out important factors that make Quisner worth cheering for. Thank you and yay! Let’s go, lanky, laid-back towers-of-power. Thanks Kristy- I do enjoy writing about Sam and John because I feel like they’re so often misrepresented in the media, but at the same time a lot of the criticisms are valid. Love “lanky, laid-back towers-of-power.” PERFECT! I really enjoyed this and believe me, I am one of those US tennis fans put off by their personas.At least they don’t have the sense of entitlement that seems to ooze from Ryan Harrison. Well, I guess the Djoker had that same thing when he was younger and it worked out. We’ll just have to wait and see.I once saw Brendan Evans at a outside court at the US Open doing his best Andy Roddick imitation against Denis Istomin. He lost. Keep up the great writing. In as much as the ATP events are moving to other places, the fact that the women’s events are still around says a lot about where the future of American tennis lies. The men’s game has become tougher and more competitive. The way that American men play tennis has not changed since the days of Sampras. American men are still playing the 70s and 80s brand of tennis. Racquet technology and slower courts have made the American style of tennis obsolete in the men’s game. The women on the other hand have made the necessary adjustments. They have gotten stronger and they are able to play on all surfaces.